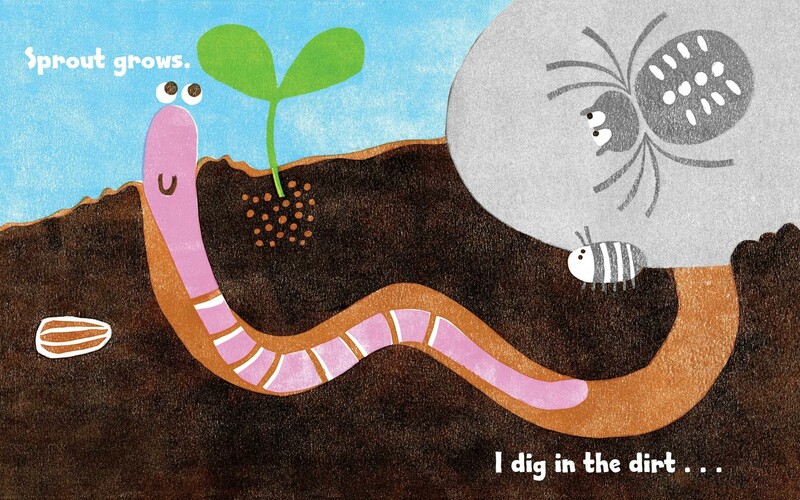 Summary: Dig in to this vibrant picture book that celebrates all the surprises found down in the dirt! 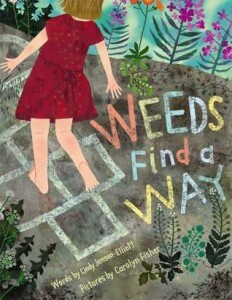 About the Author: Cindy Jenson-Elliott is the author of the celebrated Weeds Find a Way illustrated by Carolyn Fisher. She is a freelance writer for a variety of newspapers, magazines, and educational publishers, as well as a teacher and natural history instructor. She has an MA in education, and she enjoys spending time outdoors in San Diego, California, where she lives with her family. Visit her at CindyJensonElliott.com. Kellee’s Review: Both of Cindy Jenson-Elliott’s books have truly made me want to get down and dirty in the garden which, if you know me, is exactly the opposite of what you would guess I want to do. Jenson-Elliott has a way of making the ordinary, and dirty, seem extraordinary. 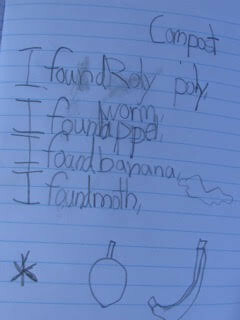 It would be great to have students catalog all of the things they find in a dirt. This would make their trips outside quite exciting! Ricki’s Review: Kellee is absolutely right. Reading this book made me want to get outside in my garden! Oh, I cannot wait for spring! When my son and I read this book, I kept pointing to the pictures and telling him about all of the digging we will do this spring, and I am excited to have this book (and Jenson-Elliott’s Weeds Find a Way) on hand for when the time comes! We live in Connecticut (which is much colder than where Kellee lives), so we can’t quite do any digging yet. This book emanates warmth, and it will make kids want to go outside and start exploring! Cindy Jenson-Elliott seems to find the beauty in things that others may perceive negatively, and I love teaching my son to find the beauty in these unappreciated things! Teachers’ Tools for Navigation: Cindy Jenson-Elliott has some amazing ideas on how to bring a garden into your curriculum (see below), but you can also use Dig In! to discuss sequencing and cause/effect. First, you can discuss sequencing by having students share each step of what needs to be done to plant and maintain a garden. You can also take the sequencing and extend it into cause/effect by discussing different things you can do to a garden to help or hurt it. It would also be interesting to ask students to research local dirt inhabitants. 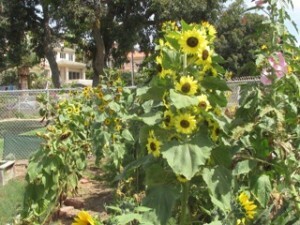 They might then research the garden plants and critters of another location to learn more about different habitats. An empty pile of dirt. A blank page. A great book. A tender idea. This is how most of my garden adventures with children begin. Teaching in the garden is alive with possibility in more ways than one. Ideas spring up like weeds – a crazy tangle without discernable order. Bringing an idea to fruition –doing something I have never done before — feels like an enormous reach. It is like trying to untangle a vine: where should the project begin? What are the steps? Who will help me figure it out? It’s terrifying — and thrilling! Teaching in the garden wakes you up to being a learner, even as you teach. You and the students are partners, learning together from nature. We all know teaching is risky business. Hands-on, project-based teaching – especially in the garden– is downright dangerous. 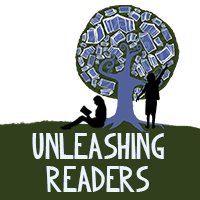 Books take the edge off and give you a jumping off point for great projects that connect inside and outside learning. Here are some book ideas to get you started on some thrilling garden adventures of your own. On one particular day in November, I shared Sunflower House by Eve Bunting with my TK- grade 3 students. 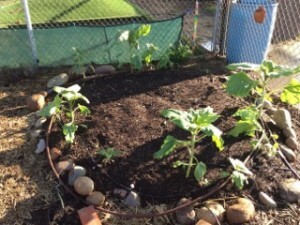 My crazy idea was to grow our own sunflower house in a bare patch of dirt in the corner of the school garden. First, I read the book to the children, and I shared my idea. We piled dirt and compost on top of cafeteria trays reserved for gardening and students worked in partners to carry them over to the corner. We made a round, flat pad 1 foot high and 10 feet across. After school, I tapped into our drip-line watering system and ran a flexible watering tube over to the circle, looping around and around. 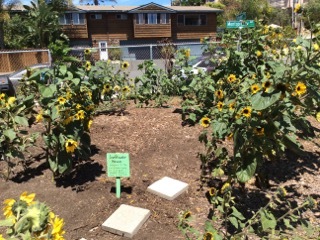 The next garden time, students added a small amount of organic fertilizer and planted dozens of sunflower seeds. We planted Russian Mammoths, but also other multicolored and multi-sized varieties. We created a pathway leading to the dirt pad, and put up stakes protecting the area. Then we sat back and and waited, working on other garden projects all the while. Winter rains in drought-stricken Southern California were sparse, but with dripping irrigation a few times a week, soon the sunflowers were sprouting. We measured them week by week, watching them grow higher and higher. Soon they were as high as a first grader’s head. Finally they were higher than my own head and shooting out buds. The Sunflower House gave us endless opportunities for learning. We measured and drew the growing plants with pastels and black paper to draw blossoms. 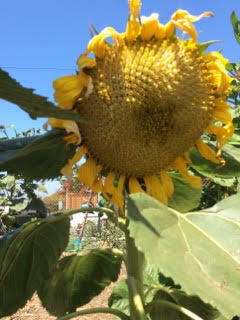 Some teachers extended the activity by learning about Van Gough and looking at his paintings of sunflowers. We watched bees visit the blossoms and learned about pollination. When the stalks dried and the heads turned inside out, we learned about the birds that came to eat the seeds. And when the next generation of sunflowers sprouted up from fallen seeds, we could see the complete cycle of life in our circle of flowers. Best of all, students loved sitting in the Sunflower House to write or draw, or just be. From one book, we developed an entire year’s worth of activities. 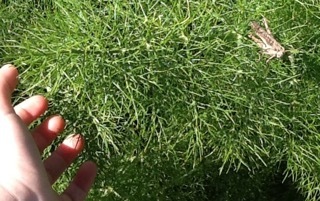 After reading my 2014 picture book Weeds Find a Way we searched our garden for the weeds pictured in the book. We drew weeds and researched them, asking how the weeds adapted for survival. Some classes used Weeds Find a Way as a mentor text to write their own “Something Finds a Way” books about another topic. We wrote poetry, and students developed social-emotional understandings by looking at the tenacity, grit and adaptability of weeds and comparing it with their own. Finally, we tried our hands at botanical drawing and we made a giant art piece to hang on the fence of the garden. A trellis we built last year to hold up a new passion fruit vine in the garden collapsed and we needed a new trellis. This problem was the catalyst for learning about bridges. Pop’s Bridge by Eve Bunting and Bridges! By Carol Johmann and Elizabeth J. Rieth, were jumping off points for learning about bridges, and designing and building a trellis to hold up our passion fruit plants. 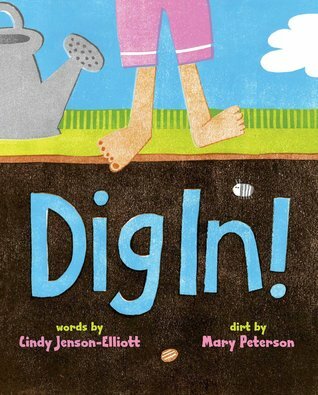 Last week we read Dig In! for the first time. 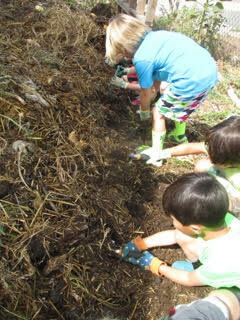 Then we went out to the garden to dig in and photograph our hands and whatever our Mixed Age Class (MAC) grade 1 – 3 students found in the school garden. Students learned to frame, take and edit photos from fabulous teacher Margit Boyeson. Students are sharing their photos to twitter at #1000HandDigIn. Picture books are the perfect way to connect inside learning and outside doing in the garden. Read Roxaboxen or Westlandia and create your own special civilization. Read Creepy Carrots and plant a less scary variety. Then write your own creepy stories. Dive into Muncha, Munch, Muncha and see what critters are eating up your garden. Then write your own stories about the critters in the garden. And before you even plant seeds, take a look at your soil. 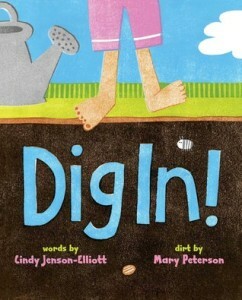 Read Dig In! and discover the wonders living in your dirt. What will you find when you Dig In! to gardening and literature? A world of wonder! 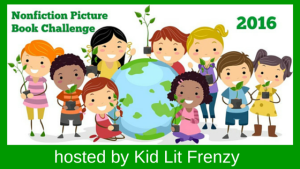 To see more literature-based projects you can do with students in the school garden, visit my website and follow the links to my naturexplorer blog at www.cindyjensonelliott.com. Discussion Questions: How are worms, spider, and pillbugs beneficial to a garden? ; What other bugs are beneficial to gardens? ; What else does a garden need to succeed? This looks fabulous. 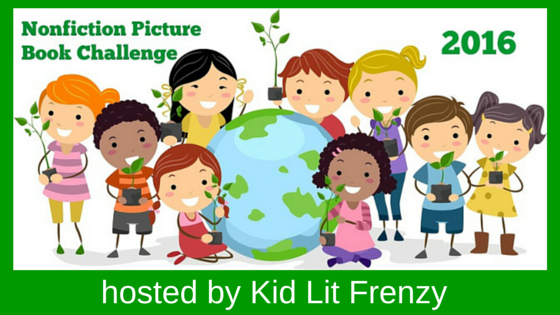 I have Curious Garden & lots of garden fiction & nonfiction pulled right now for a lesson with second grade. This would be a great addition. What a beautiful post, Kellee and Ricki, and Cindy. I have and love Weeds Find A Way, and this new book sounds great, too. My school where I taught (retired this year) keeps a garden, and students plant, volunteer to continue through the summer, harvest & cook. It’s a passion for some kids already, and new to others to “Dig In”. I wish more schools would do something. I kept a worm bin for a year with my middle-school aged students-marvelous opportunity for them. Thanks!